Home Japan	Look Mam, I’m in the Asahi! Look Mam, I’m in the Asahi! I was lucky enough to meet up with Asahi Shimbun journalist Sophie Knight last time I was in Miyagi. It was fascinating to watch her work, interviewing various people involved in the projects the volunteers were assisting with, so I was keen to see the finished article. This profile of some of the key people involved in It’s Not Just Mud (INJM) and International Disaster Relief Organization Japan (IDRO) is both interesting and illuminating. 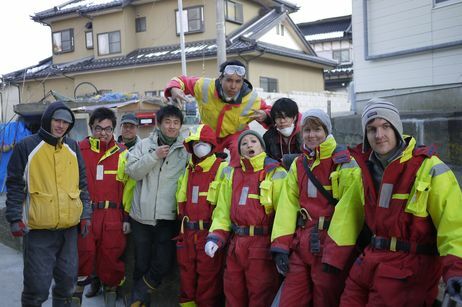 I think it has perfectly captured the motivations of the long-term volunteers in the North of Japan – not to go for sainthood or earn points – but to become part of the communities they are assisting. To work with the people affected by the disaster to restore their homes, jobs and lives in ways that are best for them. It is an excellent read, one I can’t recommend highly enough. If you feel suitably inspired, be sure to join IDRO or INJM on a future project!